Golden Delicious apples are known for their yellowish-green peel, white flesh inside and sweet taste. They are commonly used in a variety of ways including applesauce and apple butter. But did you know that this type of apple was created by chance? The seedling was created from a hybrid of two other apple varieties: Grimes Golden and Golden Reinette. The two respective trees were growing near each other and due to their proximity cross-pollinated creating a new breed: The Golden Delicious. Other than being “delicious” this apple variety is the state fruit of West Virginia because the original seed and tree grew in Clay Couty, West Virginia on the farm of the Mullin’s family. Originally called the Mullins Yellow Seedling, the head of the Mullin’s family sold his famous tree to Stark Brother’s Nursery in 1914. The Stark Brother’s were the purveyors of the Red Delicious and renamed the apple to Golden Delicious as a companion. 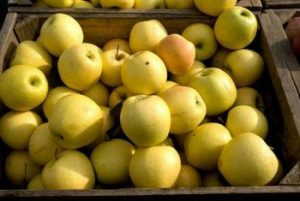 The Golden Delicious apple was now available to be sold outside of West Virginia where it gained much popularity. In fact, Stark Brother’s still sells Golden Delicious Apple Trees this day. If you are out exploring the wilderness in West Virginia, to get the full experience, make sure to bring a Golden Delicious Apple with you along on the hike. This variety of apples is low in calories and high in fiber and have the perfect balance of sugar to keep you going.